« Do non-vegans forfeit their right to critique social injustice? 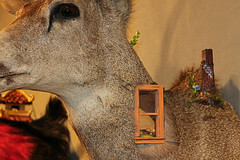 The press release for The Rogue Taxidermy 2012 Biennial tells us that it ‘features 25 of the most interesting artists working in taxidermy today.’ This may be so but unfortunately taxidermy makes for the most uninteresting art in the world today. Non-human sentient animals are not our resources to be used how we will. It makes no difference if the artists pledge to make ‘efficient use of the animals and parts of animals’, use road kill or purchase animals form the grocery store. If male artists presented women in such a degrading way we would call it sexist, if other races were discriminated against in this way this we would call it racist, similarly, to use the body parts of other animals in this way, or any way, is speciesist. I find it grating that these practitioners wish to align themselves with natural historians of the past when they so obviously have a different agenda. It smacks of a trend for adopting questionable practices from the past as a cute and vintage nod to social history, while absolving oneself of any responsibility for the choices made in producing the work. talkingparcel, I think you’ve said it really well, I’ve read you talking about taxidermy in the past and it’s always struck a chord in me – as well as being very funny! Thanks for the link to Polly Morgan, I didn’t know about that site…and shop.